Just over three weeks ago I sowed a tray of Endive seedlings. 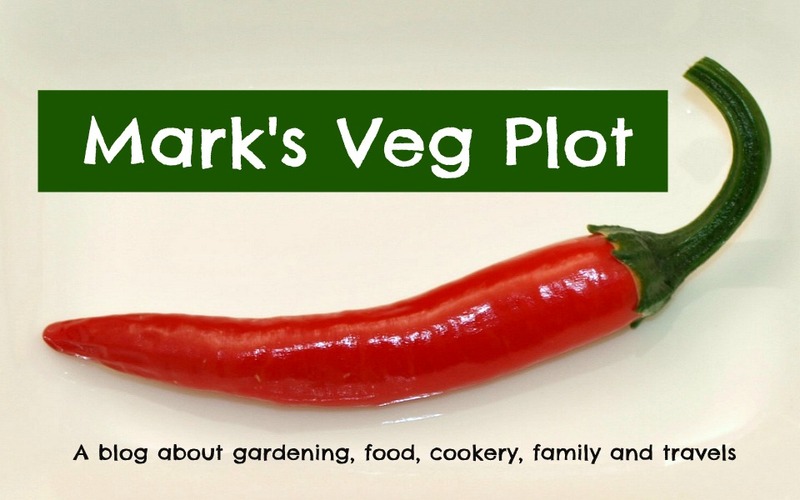 I'm hoping that after a very poor Summer for salad vegetables (due to the heat and lack of rainfall) I'll be able to produce some decent salad in the Autumn, when it will hopefully be cooler and damper! The Endives I sowed were a mix of "Wallone" and "Grosse Pancaliere", both from packets of seeds sourced for me in France by my daughter, who knows that a much wider range of Endive seeds is available there, as compared to the UK. My plan is that the two varieties will mature at slightly different times, giving me an extended harvest. The "Wallone" variety is supposedly OK until December, so it must be quite hardy. Well, anyway, three weeks later, I judged that the Endives were ready for pricking-out - in other words transferring from their seed-tray into individual pots. This will allow them to grow on without competition from their siblings and develop a strong root-system prior to being planted out. Each little plant has at least two proper leaves now, with a second pair just forming. So, I have pricked-out 22 plants, determined mainly by how many 3-inch pots fit into two of my seed-trays! With so many seedlings to choose from, I was able to select the strongest, most promising specimens. I rejected any that looked weak, or had very small roots. This is the advantage of sowing a lot more seeds than you really need, and it makes sense to do so when seeds are cheap. Each of the packets of seeds I used must have contained several hundred seeds. Even after pricking-out my 22 plants and discarding about the same number, I had still used only about half of what I started with. I'll keep these for a little bit longer, until such time as I'm happy that the potted-up ones are well established and growing strongly. One final thought for today: I have observed that slugs don't like Endives (which is nice...). Maybe they find them too bitter? If I had a tray of Lettuce seedlings outside right now, I would have to protect them, but Endives manage without. They say that the onion is the heart of every good meal, and we use loads of them in our cooking, but next after onions I think carrots are the most versatile vegetable I grow. We eat lots of them plainly boiled to accompany roast meat; we eat some as crudités to dip in hummus; we make some into soup; we include finely-chopped ones in every Cottage Pie and Italian-style ragu we make; we eat tiny ones whole and raw as pre-dinner nibbles... etc. Suffice it to say that carrots are seldom absent from our diet! I normally devote one of my raised beds to the growing of carrots, and cover it with Enviromesh to ward off the Carrot Root Fly. That bed measures 1 metre x 2.4 metres and I usually manage to squeeze in five rows of carrots. This means I can afford to grow several different varieties - though only a few of each. If I wanted to be self-sufficient in carrots I would have to use all five of my raised beds! I'm not attempting to be self-sufficient though. I just like to have a few really NICE carrots once in a while, instead of the great big tasteless ones from the supermarkets. This year, I sowed two rows of "Nantes" which are smallish early variety, two rows of "Autumn King" which are a big maincrop variety, and a half-row each of "James Scarlet Intermediate" (medium-size, early) and "Dragon, Purple". The latter were from seeds obtained at an informal seed-swap with some friends, and were only intended as a curiosity. If you are interested in this, I wrote about the actual sowing the carrots in an earlier post HERE. The early (Nantes and James Scarlet Intermediate) carrots were ready to harvest by the beginning of July, though we ate the thinnings before that. I think that early carrots are best eaten either raw or plainly boiled or steamed, so that you can really enjoy their flavour and crisp fresh texture. It would be a sin to put them in a stew! The "James Scarlet Intermediate" were the better of the two varieties in terms of looks. Quite a few of the "Nantes" ones came out forked. I don't know why one variety would do that more than another, when grown in exactly the same (sandy, stone-free) soil, but it did. The "Dragon, Purple" carrots exceeded my expectations. They had a beautiful taste as well as being very tender in texture. All this as well as a very striking appearance - although purple on the outside they are mostly orange-coloured inside, though a couple were yellow! Since we had so few of them they were all eaten raw, and before they got too big. We liked them a lot, and I plan to grow them in greater quantity next year. Just a few days ago I pulled a few of the "Autumn King" maincrop carrots, mainly just to see what they were like, because it is hard to tell from just what you see above the soil surface. They differed a lot in size, but there were some very substantial ones in the bunch. These are the sort of carrots that will stand up to long slow cooking if you want them to. I'll be harvesting these on an "as needed" basis over the coming weeks, since I don't need the space they currently occupy for Winter veg. Maincrop carrots will be OK in the ground in all but the severest Winter weather (though the ground around them might freeze and stop you harvesting them), but I like to pull most of mine before Christmas at the latest. I find that carrots left in cold wet soil are very vulnerable to slug damage, and it's better to lift them. Some people store carrots in boxes of damp sand, but I have never had enough to really make this worthwhile. We just keep a few ready-use ones in a plastic bag in the bottom of the fridge, and dig some more every now and then. Another type of carrot that we really love is the finger or cocktail type - small and usually thin. They are intended for eating raw. Over the years I have tried several different varieties, but I have decided that "Amsterdam Forcing" in its many variants (numbered I, II, III etc) is my favourite. I pulled a few of them in order to photograph them for this post, and I see that they are not as long as usual, which is a shame. For finger carrots these are quite stubby. Due to lack of space in the raised beds I usually grow this type in containers. This year I have two such containers. The first is simply a biggish (30cm diameter) flower-pot, though you can't see much of it present! The other is one of the 35-litre tubs in which I grew Early potatoes. The main thing to consider if you plan to grow carrots in containers is the fact that they put down long roots, so the container should be at least 20cm deep. Also remember that containers dry out very rapidly and need frequent watering - especially in long hot Summers like that of 2018! The cucumber is one of those vegetables that is always welcome in our house, and we eat them all the year round. During the Summer I do my best to keep us well supplied by growing them in my garden. Of course, in the absence of a greenhouse, they need to be varieties suited to outdoor growing. This year I have grown two plants each of "Marketmore" and "Delikate B". "Marketmore" is plain green, "Delikate B" is stripy. The harvest has been good this year, thanks mainly to the warm sunny weather we have had in such abundance. The "Delikate B" plants have been particularly prolific, producing probably twice as many fruits as "Marketmore". But when you look closely you see that they are quite tatty, with many brown leaves, particularly near ground level. 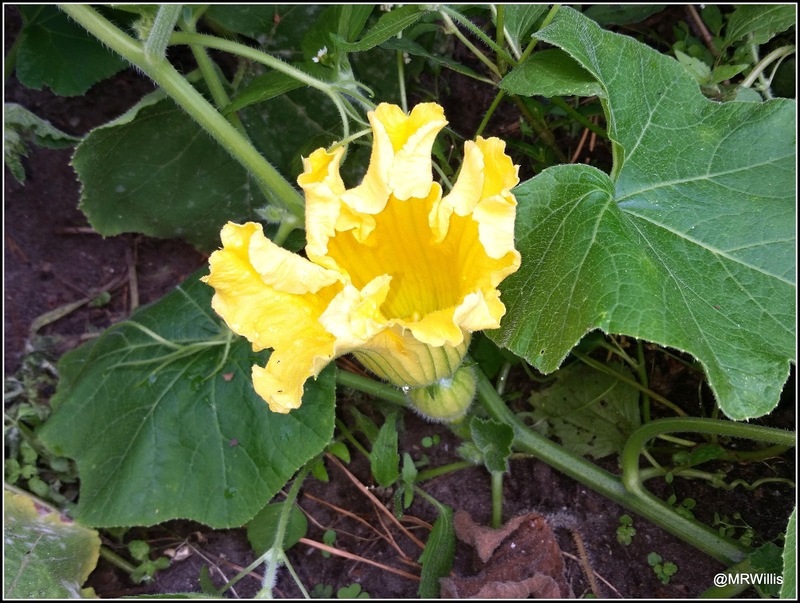 Towards the end of Summer, most of the cucurbits - cucumbers included - tend to develop Powdery Mildew. My plants are no exception. As well as being unsightly, the mildew affects the leaves' ability to transpire and to convert sunlight into energy, so the vigour of the plant declines. A few weeks back, when the mildew first appeared, I sprayed my cucumber plants with a 50/50 mix of milk and water. This was fairly successful. It killed most of the mildew and allowed the plants to go on producing, but I think I need to do it again now! I also think that it is probably best to remove the leaves most badly affected by the mildew, because I find that this often prompts the plants to produce new ones. Another thing I did to help prolong the life of the cucumber plants was to give them two good doses of general-purpose plant food, at an interval of a week. This has certainly perked them up, and quite a bit of new growth has since appeared. There are lots of fruits still, on both types, so it looks as if we will be enjoying home-grown cucumbers for at least a few more weeks. I have been to the Courtmoor plot less frequently since the weather turned cooler. In the very hot dry spell I had to go at least every other day, in order to water the plants. We have recently had a little rain (nowhere near enough) and the temperatures are the best part of 10 degrees cooler, so I only need to visit about twice a week now. Unfortunately the weeds are also enjoying the current weather conditions, so I cannot afford to ignore them for too long! 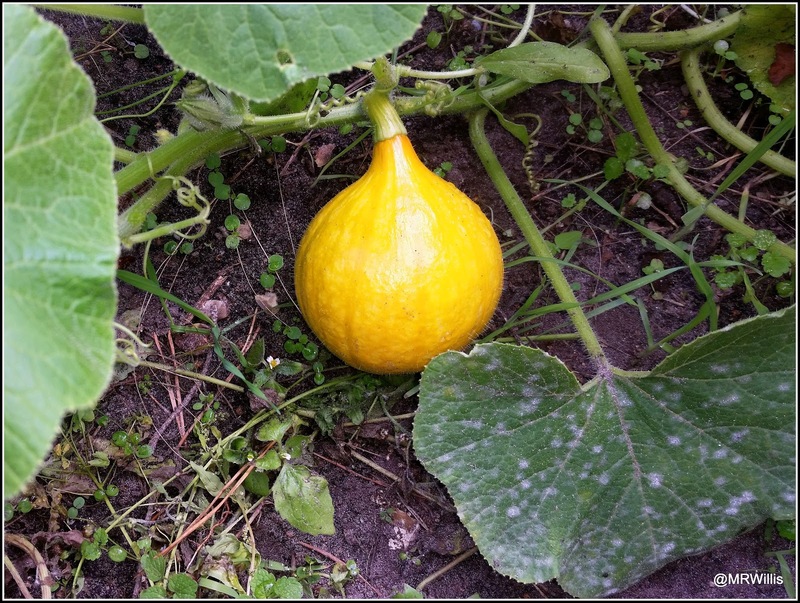 On Thursday I brought home two more of the "Uchiki Kuri" squashes, to go with the one I picked the other day. They are marginally smaller than the first one, but I believe they are still fairly typical examples of their type, which never produces huge fruit. I had been advised to wait until the stems went "corky" before picking the squashes, and this time I assessed them as sufficiently corky to justify harvesting. You'll notice that I have also followed advice to leave a sort of T-shape 'handle' of stem on the ripe fruits. Urgh, look at the mildew on that leaf! I don't know if they'll make it to maturity before the cold weather of Autumn kills off the plants, but I'm fairly sure this one has left it too late...! Another "First" for me this week was the harvest of some of the Huauzontle, aka Aztec Broccoli. It's really not much like "normal" broccoli. I think it gets its name because you pick the flowering shoots in the same way as with Purple Sprouting Broccoli. In my opinion it has a lot of similarity with the Chenopodiae like Fat Hen and Orache. Now I just have to find a good way of eating it... Apparently it performs much like Spinach. Taking a good look at the other things on the plot I was pleased to note that a couple of the Red Cabbages are looking hopeful. My first batch was all but destroyed by pigeons, back in the Spring. I left them in the ground, hoping that they would re-generate, and they have. This one, for instance, looks as if it will produce something useable. At present it's about the size of a large grapefruit. 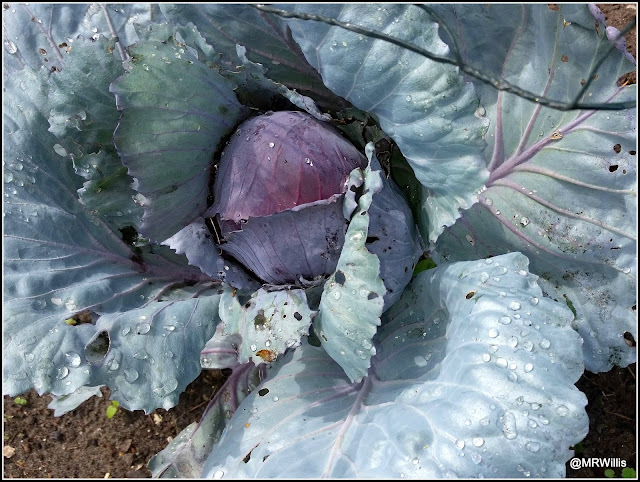 After the pigeon attack, I re-sowed and planted another batch of cabbage. This is one from that batch. It's small still, but looks pretty healthy. When people use that phrase - "some colour in the garden", they are usually referring to flowers. Not me though. As ever, my attention is fixed on the veggies! I harvested a few more "Purple Dragon" carrots on Monday. They are certainly colourful. As it happens, they taste very nice too. I don't have many of them and they seem to be quite a small type, so we ate them raw as a pre-dinner nibble. Here's another colourful beauty. It is my recently-harvested "Uchiki Kuri" squash. This type is sometimes referred to as the "Onion Squash", so I thought it would be appropriate to finish drying it in amongst my remaining "Ailsa Craig" onions. Incidentally, we have been eking out the onions and using them only as "specials". I don't see them lasting beyond the end of next month, because they are so nice. They are so mild and sweet you can quite happily eat them raw without getting smelly breath or the taste of onion lingering in your mouth for hours. I'm going to include these Runner Bean flowers in my colourful line-up (yes, I know, they are flowers, but at least they are veg flowers!). Notice the pollen on the petals! My Runner Beans have responded well to the lower temperatures and the rain we had a few days ago. They are very belatedly forming quite a lot of pods. Let's hope they mature very rapidly to make up for the pathetically poor crop they have delivered so far. The best of the pods are almost bound to be on the furthest, most difficult to reach, parts of the plants, which have climbed up into the overhanging Cockspur Thorn tree! Lots of ripe chillis are now contributing their colour. This one is "Aji Limo". So far the plant has very few fruits, but they are very attractive to look at. And this curly thing is "Whippet's Tail". 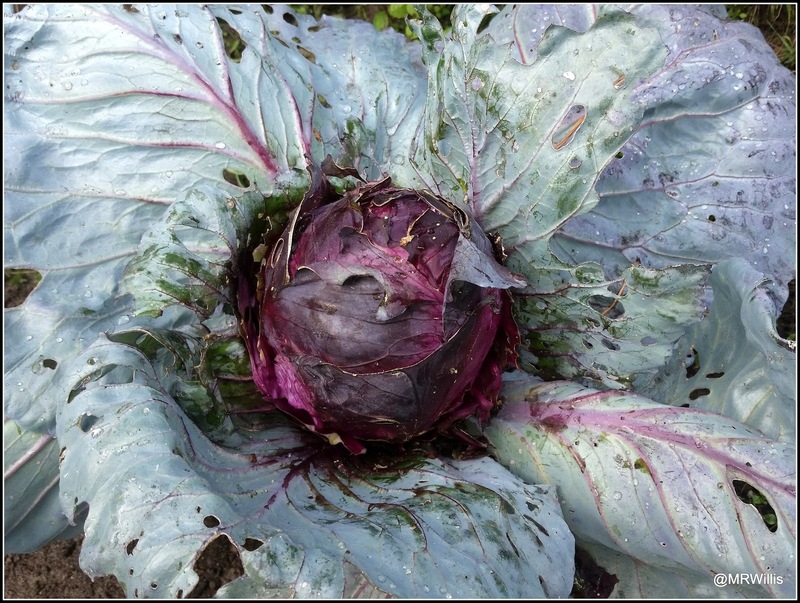 And this is a "Palla Rossa" Radicchio. It's currently a bit of a greenish-red colour but gradually turning redder, and will become even more so when the weather turns cooler in the Autumn. 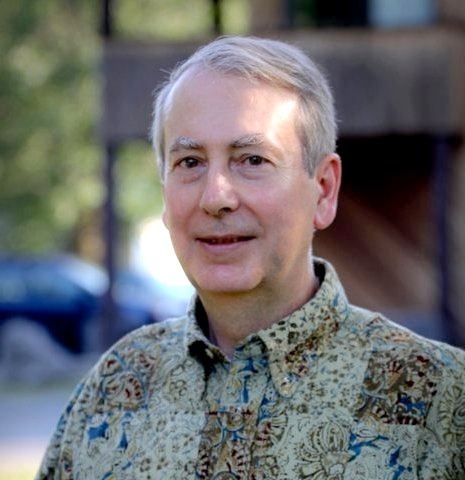 Digging biochar into the soil is actually an ancient practice. It was first used in settlements on the banks of the river Amazon, deep within the rainforest. Surprisingly, the soils of tropical forests are extremely poor – acidic and low in minerals and nutrients. When they took up farming, the indigenous people got round this problem by engineering extremely potent soils using charcoal. These human-made super soils, known as Terra Preta, still cover up to 10% of the Amazon basin today. Scientists have dated them back at least 2,500 years – some even as far back as 6,000 years. I have been sent a sample of a biochar product that is shortly (1 Sept 18) to be launched onto the market by an organisation called Sacred Earth, or to give it its full name, the Sacred Earth Community Benefit Society. Based in Horam, East Sussex, this is an environmental organisation that connects people with nature. Specialising in experiential learning, it runs courses and events designed to help people establish better relationships with themselves, each other and the natural world on its 40-acre, off-grid site. It also rents out land to entrant biodynamic farmers at affordable rates, offering them infrastructure and support. As a Community Benefit Society (CBS), all profits made are returned to the community organisation, rather than being distributed among members or external shareholders. According to Sacred Earth "The structure of biochar makes it the perfect home for the beneficial mycorrhizal fungi and friendly bacteria that are essential to healthy soil. Made by burning sustainable plant and wood waste at low temperatures, in the absence of oxygen, biochar is more porous and absorbent than common charcoal. Its surface is pitted with minuscule nooks and crannies, in which beneficial micro-organisms and fungi can flourish. When a healthy microbial ecosystem is established, a plant's root mass will become larger, which in turn allows the plant to take up more water and nutrients." If you want to know more about the product and its production process, have a look HERE. 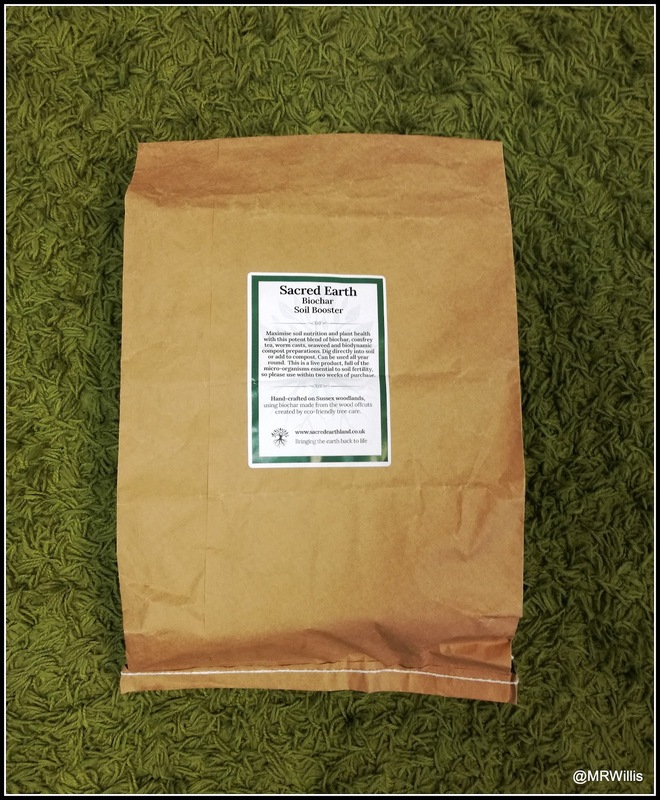 Sacred Earth have kindly sent me a 1kg sample of the product, despatched (in accordance with their principles) in a compostable bag contained within a recyclable cardboard box. When the product goes on sale in September it will be supplied only in 3kg paper sacks, again with a compostable liner. The price for 3kgs will be £9.99. Biochar can be applied directly to the soil, or mixed in with compost and then dug in. If using the former method the recommended 'dosage' is approximately 1kg per square metre, if your soil isn’t good and a little less if it’s not too bad. If you want to add it to established plants, Sacred Earth suggest incorporating a good few handfuls around the roots. You’ll need at least 1kg for a small tree. If you decide to add it to compost first, they recommend one part Biochar Soil Booster to nine parts compost. I'm planning to apply my sample directly to the smallest of my raised beds. It will be interesting to see what results it produces, but I'm very conscious that the product comes with a warning not to expect instant results: "Please note: the revival or establishment of microbial ecosystems can take time, depending on the current health and makeup of your soil. Please be patient. Sacred Earth’s Biochar Soil Booster is designed to improve the long-term health of your garden soil. You might not see its benefits the first season, but it will greatly improve your soil’s function over time." There is one other important fact to note. Sacred Earth suggest that you use your Biochar Soil Booster as soon as you receive it, because it’s a live product, bursting with the fungi and beneficial bacteria essential to soil health. They say that "due to the product’s dampness and living vibrancy, it really should be used within two weeks of purchase – to avoid it decomposing its own packaging." That's not much of a Shelf Life, is it?? It will take a lot to persuade me that this stuff is superior to my own 1-year-aged Garden Compost! Homemade compost "cooking" - Best Before End Feb 2019! Note: Sacred Earth provided me with the review sample, free of charge. I've mentioned before that I'm not usually keen on yellow tomatoes. I suppose it's a deep-seated prejudice, but to me a tomato is red, and I regard different coloured ones with suspicion! Yes, I know this is silly, but there you go... Most of the tomatoes I am growing this year bear red fruit, of course. For instance, the tally of (red) Maskotka and Montello has now exceeded 14kgs (from 8 plants). However, I want to show off a few different-coloured ones today. This is the first. It is "Tango", which has orange-coloured mini plum fruits. It's probably just a false perception, but I think they do actually taste a bit orangey. Then we have "Bumblebee Sunrise". The first few I picked were mostly yellow, with few of the red stripes, but the latest lot are much stripier. They remind me of the famous variety "Tigerella", but with the colours reversed. They look very striking in a mixed salad! I got my granddaughters to test a couple of these on Friday, and they reckoned they were sour. Maybe this is a variety that needs to be eaten very ripe? This one is the first ripe fruit of "Dwarf Beauty King", again a very beautiful red-and-yellow variety. The "Dwarf" part of this variety's name refers to the height of the plant, not the size of the fruit, which are actually quite big. This specimen weighed 121 grams. I've shown off this one in a previous post. It is "Dwarf Barossa Fest", a plain yellow one, but surprisingly tasty. These dusky beauties are "Cherokee Chocolate", a close relative of the more well-known "Cherokee Purple". The Cherokee varieties all seem to suffer a lot from deep cracks that radiate out from the stems. This may spoil their good looks somewhat, but it doesn't affect the flavour, or indeed the internal texture. These are lovely tasty tomatoes, and I think the deep colour gives them a certain richness - be it real or imagined. 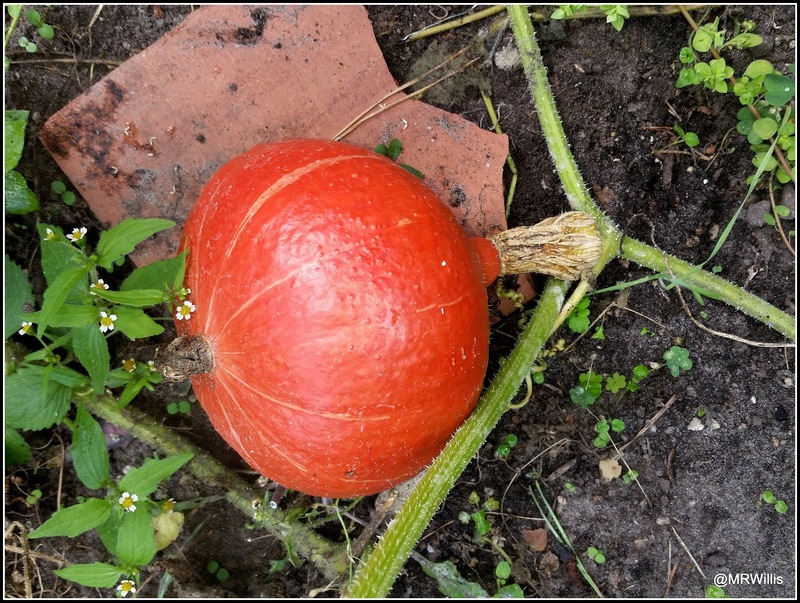 The fruits of this variety generally reach 350 or 400 grams, sometimes bigger. The two in my photo were 473g and 364g. What's your opinion? Do you think red tomatoes (in general) taste any different to yellow ones or orange, or green? The Shelling Beans are shelled. Is it worth over-Wintering chillis?